When I travel, I love to find new and uncommon foods from around the world. I always visit local markets and grocery stores to hunt unusual produce and regional ingredients. When I get home, I enjoy looking for those unique foods here in California. A few months back, I decided to plan a Bay Area meetup to share some of these interesting global foodie finds. I scoured local ethnic food stores and specialty grocers to buy a selection of rare and unusual fruits–the weirdest stuff I could find here in California. Have you tried any of these unusual fruits? Durian is a large, spiky fruit native to Southeast Asia. It’s famous for its pungent aroma and savory smell that is sometimes described as fried onions While foreigners often have a tough time stomaching the smell, it’s much loved in many parts of Asia. At our tasting, we cracked into it last, so that it wouldn’t interfere with our other flavors. Everyone tried it but only a few people liked it. The best description I heard for the strong flavor was “garlic pudding.” One #FruitCrawl attendee took some home and said she planned to make a durian cheesecake! Where to find it: Asian grocers, typically sold whole and frozen. In the Bay Area, I found durian at Lion Market in San Jose. Jackfruit is native to Southeast Asia. It’s the largest tree-borne fruit in the world and can sometimes grow up to 80 lb in weight. The starchy fruit has a subtle sweetness and apple/banana flavor. When cooked, it takes on the flavor of other ingredients and shreds like pulled pork so it is becoming popular in the U.S. as a vegan meat substitute. A few people at our meetup said they had seen jackfruit tacos on menus. Where to find it: Asian grocers, typically sold fresh, whole or by the slice. It’s becoming more common so some mainstream grocery stores stock it. I saw sliced fresh jackfruit on sale last week at a Lucky grocery store in Sunnyvale, CA. Where to find it: Well-stocked grocery stores and Asian markets. Here in the Bay Area, Mollie Stones Market sells it. Where to find it: Latin American markets and well-stocked grocery stores. Here in the Bay Area, Mollie Stones Market sells it. Kiwano is a beautiful and otherworldly-looking fruit that is native to Sub-Saharan Africa. The fruit has bright orange spiky skin filled with yellow and green seeds. The vibrant flesh tastes like lemony cucumber. Where to find it: Well-stocked grocery stores and specialty food stores. Here in the Bay Area, Mollie Stones Market sells it. 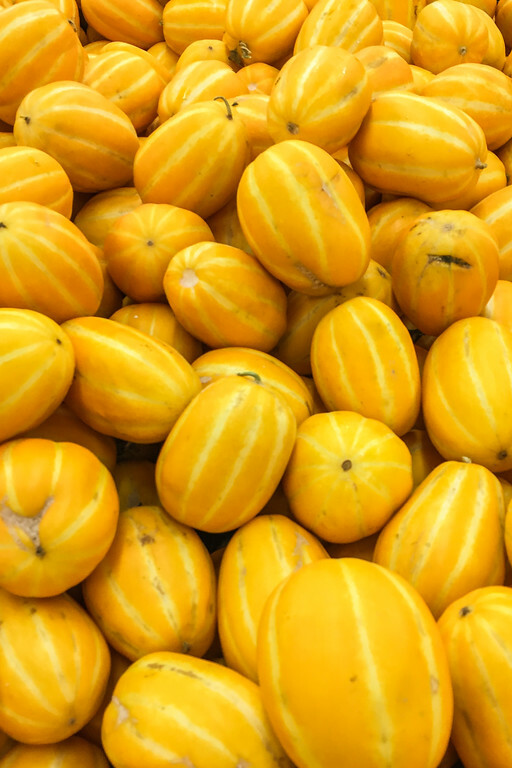 A small yellow melon with deep white stripes and white interior flesh with small, edible white seeds. The fruit tastes like a cross between honeydew and cucumber with the crisp texture of a cucumber. Where to find it: Korean grocery stores. This fruit was another one of the most popular new discoveries at #FruitCrawl. Feijoa is a small elliptical fruit with tart, slightly gritty flesh that you can scoop out with a spoon. It’s native to Brazil, Paraguay, and Argentina. Where to find it: Forage it, it’s a common garden tree in California. I suspect some homeowners with pineapple guava trees don’t know the fruit is edible! Also, look in well-stocked grocery stores and specialty food stores. Here in the Bay Area, Mollie Stones Market and the Berkeley Bowl stock it. An egg-shaped fruit with a tart, astringent, and pulpy flesh that you can scoop out with a spoon. The tamarillo is native to South America. I discovered it in the Galapagos Islands, Ecuador where it was where it blended with water and sugar and made into a juice. Loquats are a small, pear-shaped orange fruit with large seeds. It tastes like a combination of peach and mango. Where to find it: Forage it! They are a common ornamental tree in California and you’ll find them ripe in the spring. Sour plums are the same variety of summer-ripening plums that we know and love, picked in the spring when they are still sour and green. They are a common season snack food in the Middle East, where they are enjoyed dipped in salt. Where to find it: Middle Eastern grocery stores. Longan is a small round fruit with a translucent white flesh and a shiny black seed. Longan means “dragon’s eye” in Chinese, and is named because it looks like an eyeball when shelled. Longan is native to South Asia and is similar in appearance and texture to lychee. Where to find it: Asian grocery stores. A small orange berry that is sour and sweet. It’s related to tomatoes and tomatillos and you can sometimes see it sold encased in a papery husk similar to a tomatillo. The fruit is native to the Americas but it is most common today in South America. In Peru, the fruit (called aguaymanto) is added to pisco soure and it makes a delicious cocktail. Where to find it: Well-stocked grocery stores and specialty food stores. Here in the Bay Area, I’ve seen it several times at the Berkeley Bowl and, once, at Whole Foods Palo Alto. Where to find it: Forage it! One of my neighbors has a tree in her front yard and offered some of them to me, just in time for #FruitCrawl! A small oval and sweet red fruit that wrinkles and looks like a date when it’s mature. Native to China, but now grown around the world.